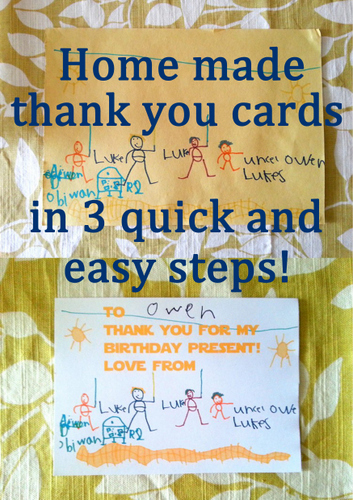 a touch of domesticity: Crafting with Kids: home-made thank you cards in 3 quick & easy steps! Crafting with Kids: home-made thank you cards in 3 quick & easy steps! So this is the way it goes it my house: child has birthday. Child receives birthday presents. Child needs to send thank you letters. Mother keeps forgetting. It was the Little One's birthday in early June and now the month's been and gone I've really got to get these 'thank you' cards sorted! It's important to me that those people who were kind and generous enough to give a present get a meaningful thank you in return. That means different things to different people, but to me it means a handmade thank you card. It is also important to me that I don't give myself yet another huge 'to do' on top of everything else, and that writing 'thank you's' is not something my children dread as a chore. 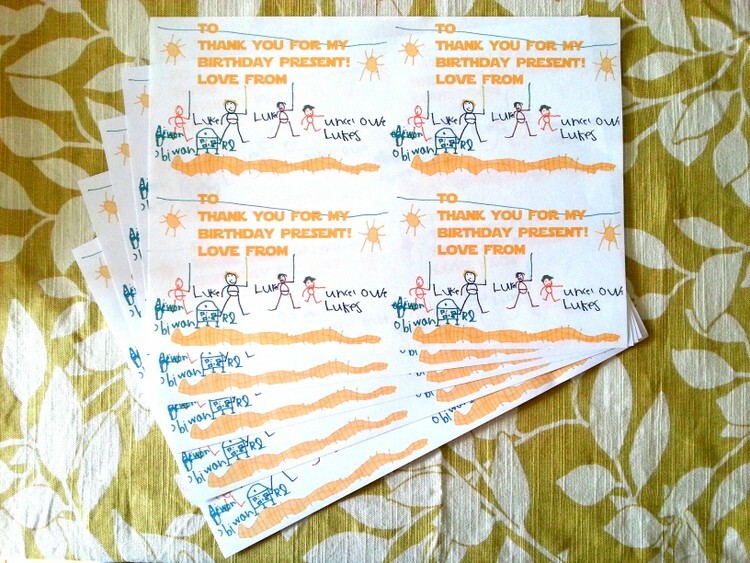 You can see the colourful 'thank you' cards my Tiny One made after his birthday here. But I can't do the same thing with the Little One (their birthdays are two months apart and my aunties would remember!). Step one: Find an appropriate picture your child has made, or get them to make one. 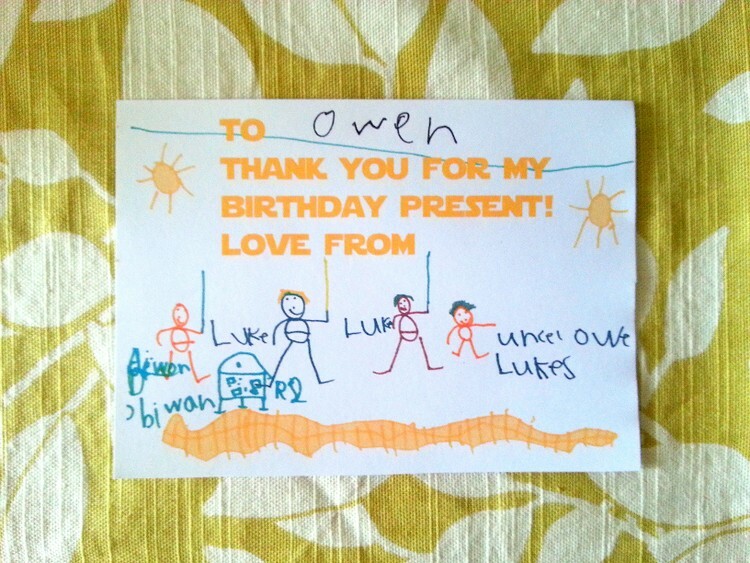 I used a Star Wars picture my six year old made for his Star Wars party but it would've been more sensible to find one on a white background. Of course, you can keep a coloured background but I was being thrifty and avoiding caning through all that yellow ink! Step two: Scan and upload your picture. Now, if you have photoshop like me, you can white out the coloured background and add some text (I used a free Star Wars font that I downloaded). If not, get your fabulously helpful child to make you a bespoke picture and write 'thank you' etc on it. Using photoshop or your programme of choice, multiply that photo into four on an A4 sheet. You could do this using a photo mosaic programme too. Helpful? If you want more specific instructions on how to do this on photoshop (it took me less than half an hour), do let me know! Wow! This is brilliant Katie. My just-turned-seven year old could have drawn these. 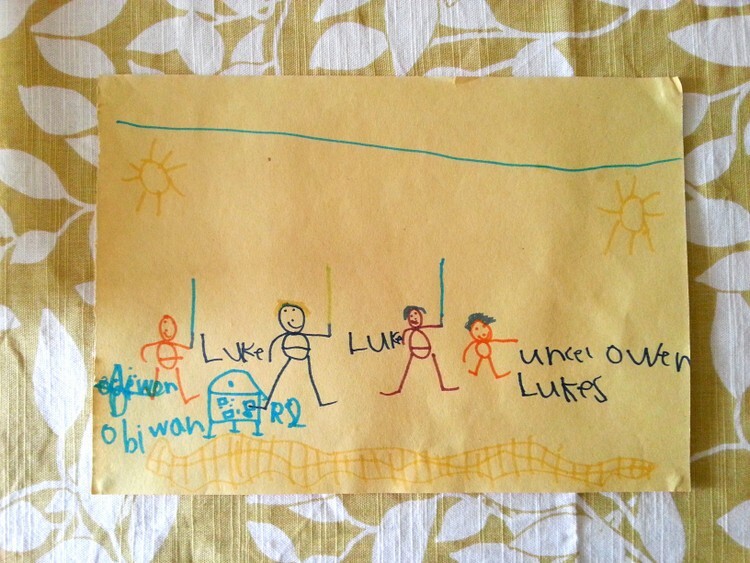 His Star Wars pictures are almost identical to this one. I'm going to get him to do some thank you cards today. Thanks Fionnuala! I can't tell you how many Star Wars pictures are now in our house, especially if you count all the stored ones from my now-16 year old's obsession in years past! Yes, we do homemade thank yous too. I don't do much touching other than run them off on the copier, which can be a feat when you do a fold over card with pictures outside and in, and then we fold. My son gets to address the envelopes and then I cross my fingers that the postal service workers can read his handwriting. Our relatives are always thrilled to receive the handmade card. I am definitely going to get some heavier stock now though. You've inspired me to do a similar post. Thank you. Great idea - I need to get better at doing this!